For centuries, the racing rapids of the St. Mary's River have served as a crossroads for people moving between Lake Superior to the north and Lake Huron and the other Great Lakes to the south. Long the home of the Ojibwe People, the first Europeans here were French explorers. They were soon followed by fur traders and missionaries. This was an ideal location for both a commercial and military base. Settlements were established on both sides of the river and each grew into prosperous communities sharing not only the river but also the name - Sault Ste. Marie (sault pronounced 'soo', comes from an older French word meaning 'rapids' or 'falls'). The cities are an important link in the St. Lawrence Seaway system and the locks on the St. Mary's River are impressive. 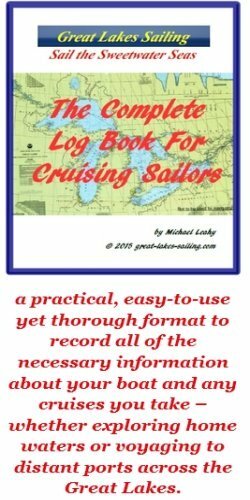 For the cruising sailor, heading either north or south, Sault Sainte Marie Ontario is an important port. For north-bound sailors, it is the last full-service port for hundreds of miles on the Canadian side of Lake Superior and nearly so on the American side. For south-bound sailors, Sault Sainte Marie offers an opportunity for full reprovisioning, repairs if necessary and some of the pleasures afforded by a large city. Both Sault Ste Marie Ontario and Sault Ste Marie Michigan offer generally similar facilities and services. Sault Ste Marie Ontario is the larger of the two cities and in fact is the 3rd largest city in Northern Ontario. As a result, it will have most things a sailor may need. If you are a Canadian planning to cruise the American waters of Lake Superior, it makes sense to enter the United States in Sault Ste Marie Michigan to complete customs and immigration proceedures. Likewise, for American sailors who plan to cruise west along the Canadian north coast of Lake Superior, it would make sense to enter Canada via Sault Ste Marie Ontario. The Soo Locks on the St. Mary's River are the busiest locks in the world! On average, 10,000 commercial ships pass through the locks each year. The locks span the river. The American side is used by commercial ships and to a lesser extent, recreational sailors. The Canadian side is exclusively for recreational/private vessels. The Canadian side is also faster to negotiate and you do not have to share space with a 1,000' behemoth or a hardworking tug. The approaches are well-marked and straight forward. It is prudent to stay within the marked channels and follow directions carefully. The preferred locks are the Canadian Locks. Upon approach, you will see a large sign with RED triangle marked with L/A meaning 'Limit of Approach'. Contact the Lock Master on Ch 14 radioing for "VDX 23 Canadian Canal" for locking through instructions. The light signals are straight forward: F RED = wait / stand by; Fl RED = lock being prepared; F GREEN = proceed into lock. Have fenders deployed as well as long lines ready on deck fore and aft. There are vertical cables inside the lock chamber that you can loop lines around. DO NOT TIE OFF TO THESE CABLES. As the water level changes, your boat will 'ride' up and down these cables, held along side as she moves. Be prepared for turbulence. For safety, all crew should be wearing life jackets. If instead of the fixed cables inside the locks, you find you have to use your own lines, ensure you have 75-100 ft/23-31 m of line to use with the bollard ashore. The American Locks are primarily commercial in nature. There are 4: McArthur, Poe, Davis and Sabine. Sabine is not operational. Davis is used infrequently. A cruising sailor has to keep in mind that commercial vessels have priority and therefore wait times can be longer. As well, you will be sharing close quarters with some very large vessels so prudence is the watchword. On approach, call the Lock Master on Ch14 or 16 radioing for "WUD 31". Identfy yourself, advise direction of passage and await instructions. You will likely be directed into McArthur Lock. Light signals are as follows: RED = wait/stand by; YELLOW = lock being prepared; GREEN = proceed into lock. Have fenders ready plus lines ready (75-100 ft/23-31 m). Lock attendants may have lines available but it is far better to be fully prepared. Be prepared for turbulence. For safety, all crew should be wearing life jackets. NOTE: Due to the current in the St. Mary's River, regarless of your route, it is best to begin your entry into the marina from downstream. This way, your approach is controlled. Bondar Marina is located immediately downstream of the Canadian Locks. Look for the distinctive white tent structure of Bondar Park - the marina entrance is about 400 ft/130 m past that. The marina is located right in the heart of downtown Sault Ste Marie Ontario. The marina has 38 slips and 450 ft/137 m of dock for transient sailors. There is a fuel dock (diesel and gasoline) and pumpout station. There is water and power dockside. There are washrooms, showers and laundry available. and there is a ship's store with charts and boat supplies in stock. There is internet access. Next door is Roberta Bondar Park, named after Canada's first female astronaut and a native of Sault Ste Marie Ontario. The park features a unique and striking tent-like pavillion which can seat nearly 2,000 people. Bellevue Marina is located approximately 1.4 nm downriver from the large white tent-like structure at Bondar Park. Ther are 174 slips and a number are allocated for transient sailors. Not all are services. There is a fuel dock (diesel and gasoline) and a pumpout station. Washrooms and showers are available. There is parkland immediately adjacent to the marina. Bellevue is further away from downtown Sault Ste Mari. However, there is a shopping plaza within walking distance. ASC is located approximately 1 nm downriver from Bellevue Marina, in the cove created by Topsail Island - the spit of land that extends out into the river. There are two basins. A transient sailor can anchor in the outer basin. There are no docks, other than a dingy dock. The clubhouse has washrooms and showers. There is no waterfront marine maintenance service for recreational vessels in Sault Ste Marie Ontario. R & R Marine in Sault Ste Marie Michigan is a full-service marine maintenance shop. They can carry out full repairs and maintenance on engines, mechanical systems, electrical systems and electronics. Just remember, if you decide to use their services, you must clear into the United Staes first and then report back in to Canadian authorities when you return. There are several shops inland that can carry out specific services. Marina staff may be able to provide some contacts. Superior Marine is located about 3 mi/5km inland. They can carry out engine and mechanical repairs. Kelly's Grocery is located in the Station Mall, about 1 block from Bondar Marina. This is the largest shopping mall in Northern Ontario and its 100+stores will likely have most items you may need. Cambrian Mall is located north of Bellevue Marina. It has a wide assortment of stores including Rome's Independent Grocer, a large grocery store. There are a number of banks and ATM machines across the city. The closest to Bondar Marina is a TD Bank and the closest to Bellevue Marina and Algoma Sail Club is a CIBC Bank. Both will have ATM's. Sault Area Hospital (705) 759-3434 is a major, full-service hospital. It is located several miles/kilometers north of the waterfront. Station Mall Drug Mart (705) 749-7331 is located in the Sation Mall, near Bondar Marina. Rexall Pharmacy (705) 759-3370 is closer to Bellevue Marina. Sault Ste Marie Ontario has a number of really nice restaurants and pubs including some terrific Italian restaurants. Places to consider include Solo Trattoria and Arturo Ristorante Italiano. Docks River Front Grill is adjacent to Bondar Marina. There are many more in downtown Sault Ste Mar, all within walking distance. There is a good museum at the Canadian Locks. A lovely walking trail can lead you outto Whitefish Island, giving you an impressive view of the rapids in the St. Mary's River. The Norgoma Museum Ship, located at the Bondar Marina, has numerous displays depicting the history of the area. A bit further east from Bondar Marina is the Canadian Bushplane Heritage Museum honouring the many accomplishments of this iconic aircraft and its pivotal role in Canada's aviation history. For an interesting daytrip, consider taking the Algoma Central Agawa Canyon train north to the Agawa Canyon. People come from as far away as Toronto to experience this trip into stunning 'north of Superior' scenery. The highlight is a stop in the Agawa Canyon after a 500ft/152 m descent from the canyon rim to its floor. A quick look at this Sault Ste Marie Ontario tourism site will give you some ideas on getting the most of your visit.